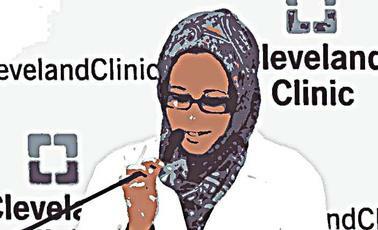 In a clandestine mission that had the makings of a hostage rescue, the Cleveland Clinic and its lawyers arranged for medical resident Suha Abushamma to fly back to the United States yesterday, more than a week after she was forced to leave because of President Donald Trump’s travel ban. Abushamma is being introduced at a news conference at this hour at the Intercontinental Hotel in Cleveland. Abushamma was among the highest-profile people affected by the president’s executive order, which banned visitors from seven predominantly Muslim countries. A first-year resident at the Cleveland Clinic, she was forced to leave the U.S. hours after landing at New York’s John F. Kennedy International Airport on Saturday, Jan. 28. Abushamma, a Sudanese citizen, was given the choice of withdrawing her visa application “voluntarily” or being forcibly deported and not allowed back to the U.S. for at least five years. She chose to withdraw her visa application, meaning she did not have a valid document with which to enter the U.S. She flew back to Saudi Arabia, where her family lives. Her return to the U.S. resulted from high-level discussions between lawyers for the clinic, outside lawyers working with them and officials at the U.S. Attorney’s office for the Eastern District of New York. Even though Abushamma’s visa was cancelled, the U.S. Attorney’s office secured permission for her to return yesterday without problem, said David Rowan, the clinic’s chief legal officer. Abushamma said she hadn’t lost hope, even when her situation appeared most tangled. Rowan would not discuss specifics of the Cleveland Clinic team’s conversations with the U.S. Attorney’s office. Even when a federal judge in Washington state issued a stay late Friday, preventing Trump’s executive order from being enforced, the ruling did not apply to Abushamma because she didn’t have a valid visa in hand. Other doctors and family members returned before she did. Rowan said the legal team explored a variety of options to get Abushamma back. For one, she sued Trump and other federal officials, seeking her return. The lawsuit contends that Abushamma was denied access to legal advice and was unlawfully removed. Abushamma will be filing a notice to dismiss her lawsuit this afternoon, though that was not a condition of her return, said Jennifer Kroman, an attorney for Cleary Gottlieb Steen & Hamilton, which represented Abushamma in the lawsuit pro bono. Abushamma took off from Jeddah, Saudi Arabia, at about 6 a.m. Monday morning, which is about 10 p.m. Sunday in New York. She landed at John F. Kennedy International Airport a little after 11 a.m. Monday, where she was greeted by lawyers and a team from the clinic. They returned to Cleveland later in the day. Her trip back was not assured. Although lawyers for both sides had agreed that she would be allowed back in, they kept it quiet. Even airport workers were not fully clued in. Abushamma said she booked her ticket to return on Saturday. And on Sunday night, she flew from Yanbu, where her family lives, to Jeddah. After resting at a friend’s house for a few hours, she returned to the Jeddah airport at 3 a.m. There, a ticket agent looked at her passport and, not seeing a valid visa, alerted an airline supervisor. The supervisor told Abushamma that he had received an email about her and said, “I knew you were going to be boarding the plane.” But he, too, was confused and took her documents for 35 minutes before giving her a boarding pass and allowing her to proceed. Once through security, Abushamma said, she was asked for her passport again and had to wait five minutes. Finally, she said, while boarding the plane, when the ticket agent scanned her boarding pass, she saw “high-risk passenger” pop up on the screen for a split second before a light turned green allowing her to board. She remained in contact with her legal team until the plane took off. They gave her a form to sign, stamped her passport as if she had a H-1B visa (her original visa type before it was canceled) and escorted her to get her luggage. Reporters were waiting outside customs, so Abushamma was let out a side door where she was greeted by Cleveland Clinic colleagues, including Dr. Abby Spencer, program director for the internal medicine residency program. The Cleveland Clinic’s chief executive, Dr. Toby Cosgrove, is a close advisor to Trump. Cosgrove and the clinic “have been very concerned about the effects of the executive order on health care itself, education and research, and Dr. Cosgrove has put forth proposals” about how the order could be applied, taking into account the unique issues in health care, Rowan said. Abushamma said the experience has been unforgettable.